With the weather getting warmer it has been project week in my house. During the spring I set aside a couple of weeks to do all the projects that I have put off for the last year. This year it is painting furniture, my dining room and re-staining a few tables. I have completed half of the things that I need to finish so that's a start. It always seems ten times harder to finish anything with a 4 and 6-year-old. My youngest loves doing his workbooks, but hates playing by himself. Plus he is in a phase where he wants to to everything with mommy. So tonight after my husband got home I painted the dining room while he worked on a painting project of his own. I have been a little behind on my posts and cooking this week since I have been busy, but I should be back to normal in another week. This week I tried a new recipe for Grilled Turkey Burgers with Pineapple Salsa from the Food Network Canada. This recipe has 11 ingredients. It takes 27 minutes of total time, 15 minutes of which is active and makes 6 servings. I did make a few changes to the original recipe. First my mother-in-law gave me a number of frozen turkey patties that had sat in my freezer for months. So instead of making the turkey burgers from scratch, I utilized the frozen patties. All the red peppers at my local grocery store where not usable, so I substituted a yellow pepper instead. I chose to include the jalapeno in the salsa, but seeded it since my kids would be enjoying some. I served regular buns for the rest of the family and gluten free for me. The salsa in this recipe is really delicious. It made the store bought burgers much better and was also delicious as a sweet side salad the next day. 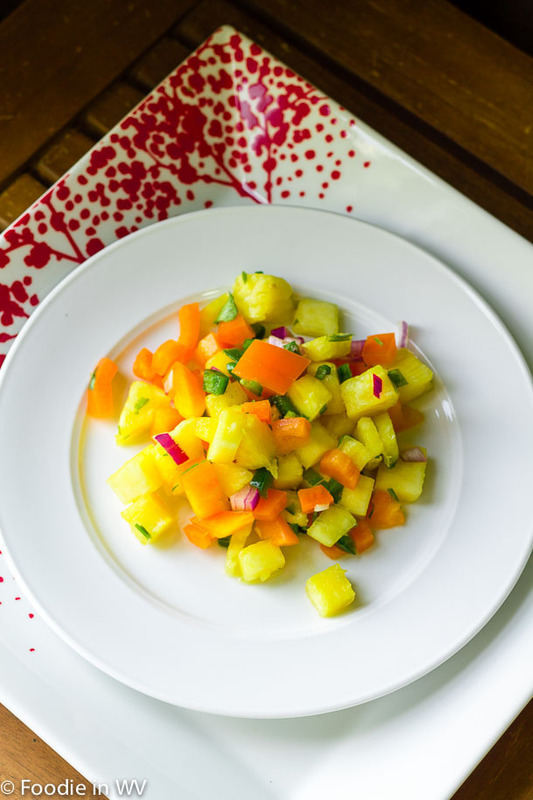 The taste of the fresh pineapple was sweet and blended nicely with the strong flavors of the onion and jalapeno. 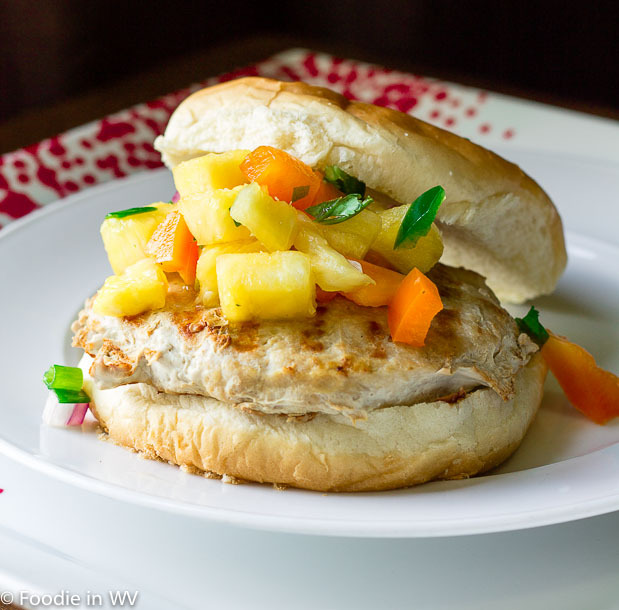 For the recipe go to Grilled Turkey Burgers with Pineapple Salsa. I love turkey burgers but they can be pretty bland so this looks like a great way to eat them! Thanks for the recipe. I love pineapple salsa, but I never thought to put it on any kind of burger. I need to try this! I love pineapple salsa also and it was great on the burgers! The salsa must help with the overall flavor as turkey burgers can be bland. This looks good. I agree that they can be bland, but the salsa works really well to add flavor! I love turkey burgers - almost better than I like ground beef ones. These sound amazing. I love turkey burgers also! I've never seen a pineapple salsa, but it sounds delicious. Oh that looks so good, I am going to have to try it.